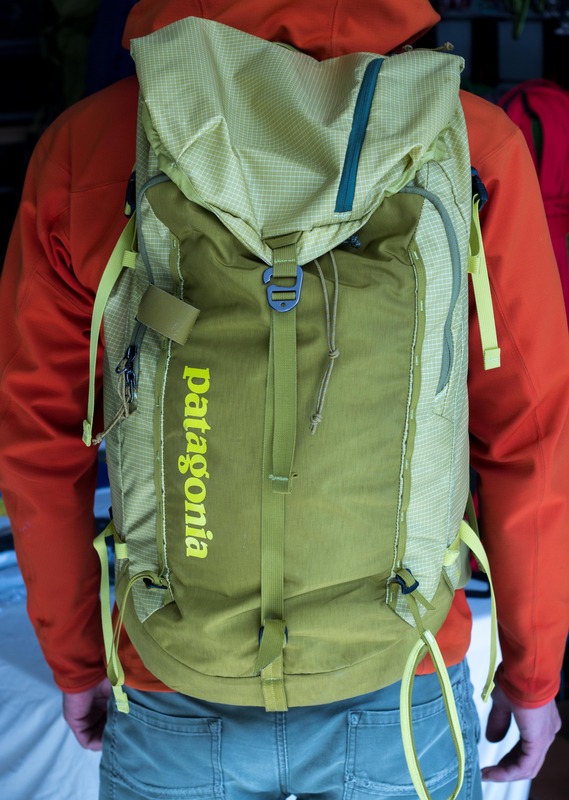 The new Descensionist ski touring / ski mountaineering pack from Patagonia is based on the design on the popular Ascensionist, an alpine / mountaineering pack. 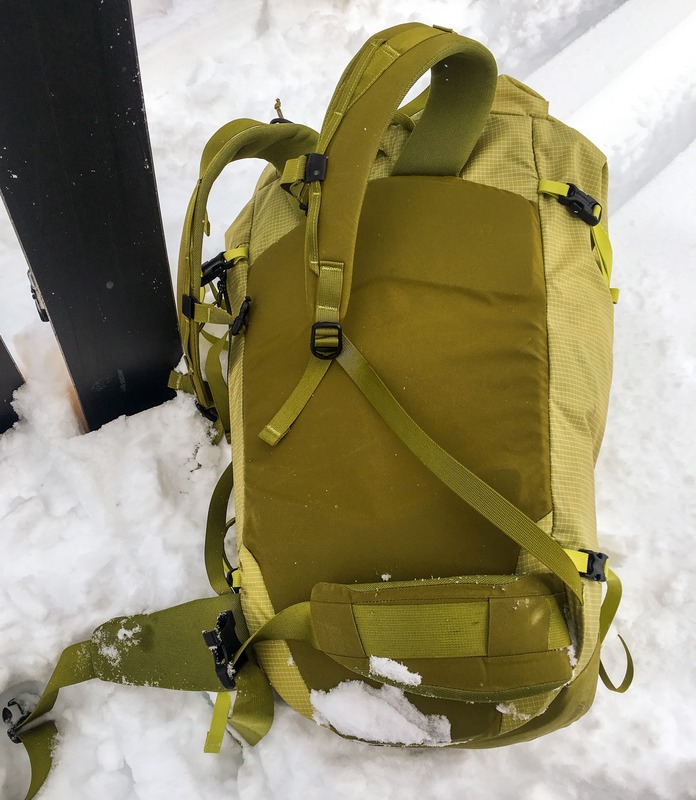 This means that many of the attributes that made the Ascensionist such a hit are present on the new pack, just with a focus on back country skiing. The Descensionist has the key features required for touring in a light-weight and elegantly simple package. 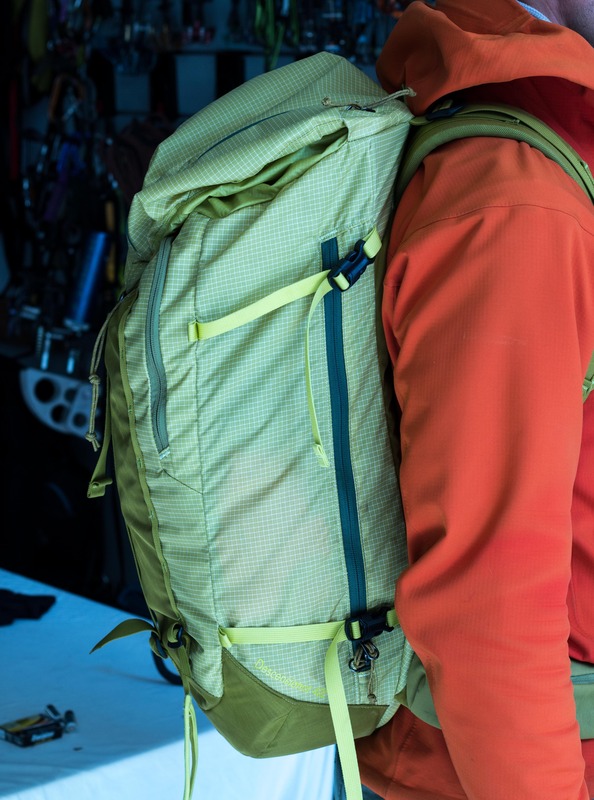 Undoubtedly this new ski pack will be as popular as its alpine climbing cousin. Boot packing / wallowing up a steep slope in the Valkyr range of BC. Photo Credit to Heather Smith. Front, Base & Rear Panel – 420D Cordura. Both w. a polyurethane coating. 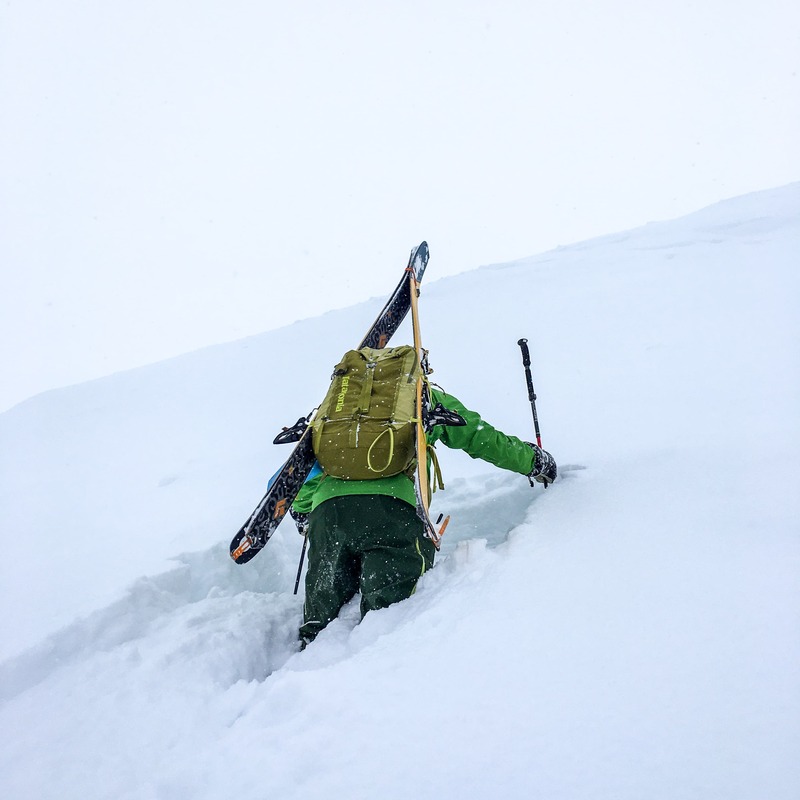 At its core, the Descensionist is basically the Ascensionist pack with the addition/alteration of several features to adapt it for backcountry skiers. 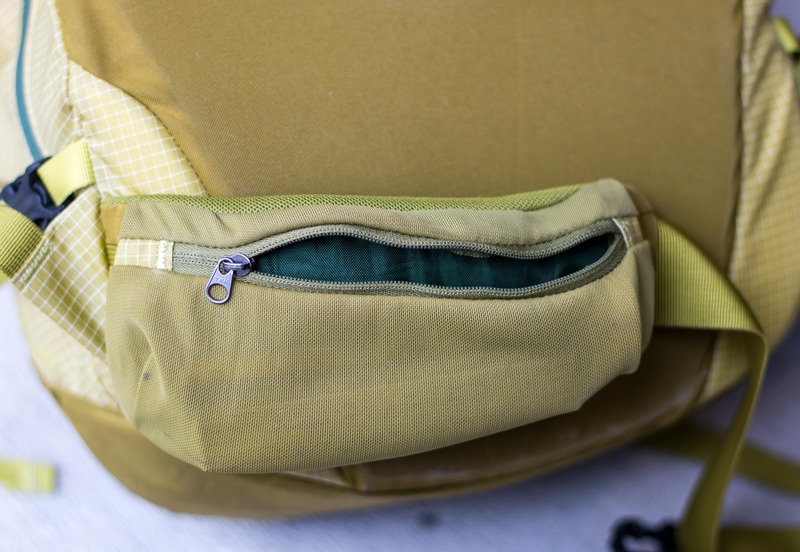 Basically the fabric was beefed in certain areas, a size zipper was added for access, ski/snowboard carry systems added and of course a snow safety kit pocket was added as well. Now there are a number of other small differences but this captures the essence of the changes. What didn’t change is the elegantly simple nature of the pack and its compressability. Stash the top lid inside and pull on the side compression straps and the pack shrinks right down. The Descensionist is basically a standard top-loading pack except that the draw-cord closure feeds through the lid and so serves to pull the lid down as well as close the main compartment. When fully opened the top access makes loading and unloading the bag easy. A simple metal clip secures the lid in place when closed. More durable than a plastic clip. The main compartment fully opened. To close it up simply pull on the draw cord. A side zipper provides access along the wearer’s right-hand side. A great feature in that it allows access to items stashed at the bottom of the pack without the need to unload everything. Having gotten used to this feature on a number of my ski and alpine climbing packs I find it hard to go back to regular top-loaders. Side view of the pack. The side access zipper is visible as are the dual compression/A-frame ski carry straps. I really like that both straps have clips as it speeds up packing and unpacking skis. 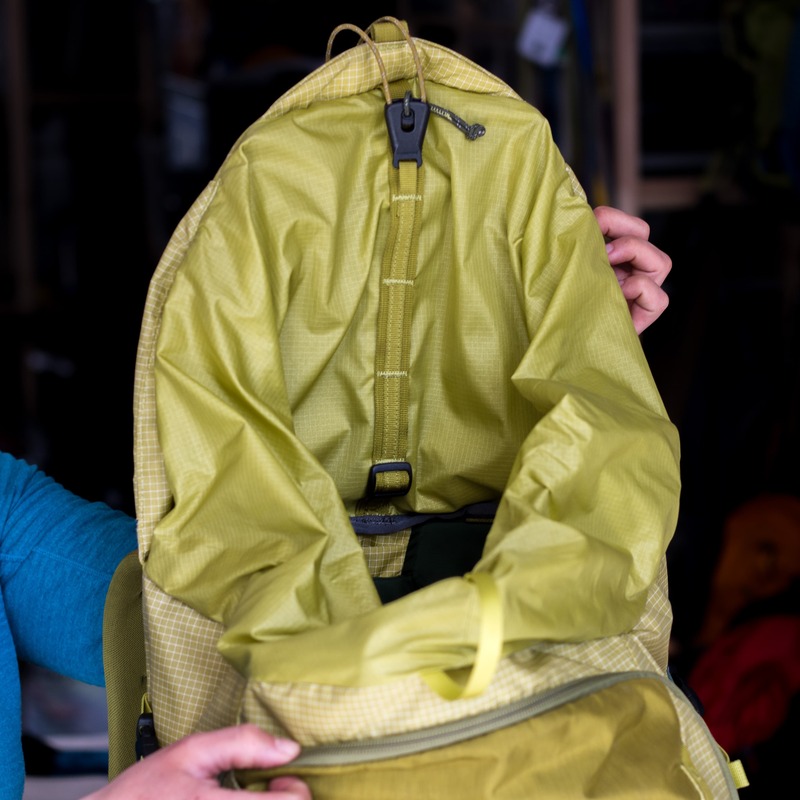 The Descensionist is a clean and simple pack with only the bare necessities of pockets. As with any top-loader there’s a zippered pocket on the top for smaller items. The only other pocket is a small stretchy mesh affair found on the right hip belt, great for a bar or sunscreen. Of course there’s an area for your snow safety kit thought I don’t know if I would call it a pocket. Flexible mesh pocket found on the right hip. Surprisingly comfortable for a frame-less pack the Descensionist has a removable HD foam back panel to provide support and structure. I never tested the pack without the foam back panel but expect that removing it would make it a very packable summit bag for longer tours. Likely noticeable less comfortable as well though. Rear view of the Descensionist. The metal clip that secures the top lid closed is visible as is the top lid pocket. The loop that’s hanging from the bottom right of the pack is lower portion of the diagonal ski carry system. Snow sticking to the bottom of the back panel. The suspension system is fairly standard, fit my 5’-10” frame very well and felt comfortable when walking or skiing. I would expect that with a heavy multi-day load it would be less comfortable than a pack with a proper frame though. The trade-off of course is the weight. The fabric over the foam back panel had a tendency to get wet if I was not careful putting it down to get something out of the main compartment. Primarily an issue at the lumbar as cold snow would then stick to the wet fabric. 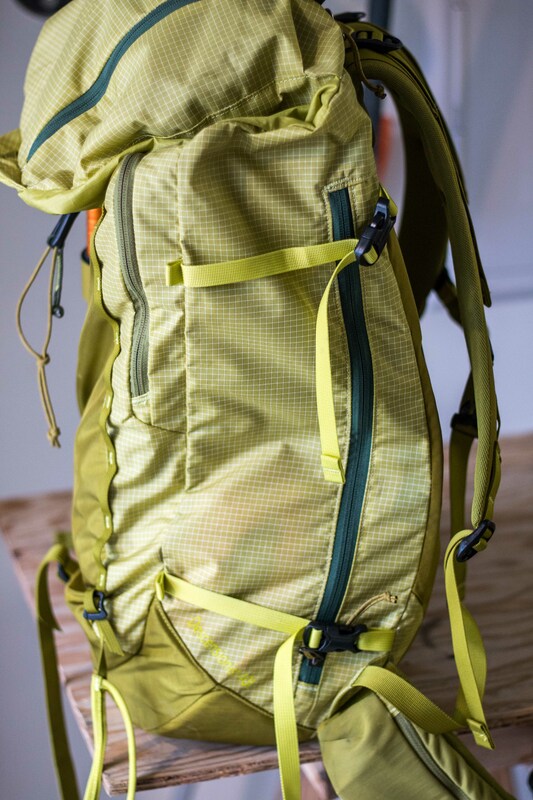 The pack comes with a few extra straps and dual daisy chains down the back. While they don’t add much weight they do provide some versatility. The ice axe attachment system can be moved from side to side as can the diagonal ski carry. It would also be easy to add an additional ice axe attachment point if you were interested in using the pack year-round. While the pockets are quite limited on the Descensionist I never really found it to be an issue. If I wanted more storage for small bits and pieces like a repair kit or snow science kit I simply put them in a small bag, I have a bunch of organizational bags from Onsite Equipment that work great. One thing that I do feel is lacking in the features list is a method of stowing a helmet. Now as a 40L pack there’s ample room on day trips to store the helmet inside but it would have been nice to have an external attachment system as well. Helmets have become commonplace in the backcountry and I’m surprised when new packs come out without such a feature. The only other thing that I thought was lacking is a small gear loop on the waist belt. As there’s only a pocket on one side a gear loop for glacier kit would have been a great feature for the other side. Alas it’s not a big deal, I’m just being a bit picky. Overall: If you’re looking for a simple, light-weight and functional ski pack then the versatile Descentionist is a great option. And while it doesn’t have a helmet attachment system it’s very expandable allowing a helmet to be stored inside. Black Sheep Adventure Sports was provided with a test sample for review but of course this didn’t influence us in any way.